Game 1 was a goalie's nightmare, but a fan's delight as the Washington Capitals and Vegas Golden Knights go down to the wire in a thriller. This game had it all. Goals in bunches, never a two-goal lead until the dying seconds, timely goaltending, grit, and so much emotion. The depth of both teams shone through; although Vegas' was a little brighter. It isn't often that you call a home ice win a gutsy one but Vegas pulled off a very gutsy effort tonight. In the same breath Washington came that close to shocking the rocking crowd in hockey's newest city. This game was about as far from pretty as they come. Marc-Andre Fleury, the Vegas Golden Knights' mainstay in the crease looked nervous at times. His saving grace was that Washington Capitals' goaltender Braden Holtby looked more shaky. Vegas will sleep easy tonight knowing they took Game 1 without Fleury having to make breathtaking saves. In saying that... expect both goalies to be considerably better in Game 2. It is also important to point out that goalies have the hardest time, generally, staying in a rhythm with long layoffs. Fleury hadn't played in over a week, and Holtby five days. Those are not easy layoffs to handle for reminders. Fleury did make some key stops however. At 19:04 of the first, Fleury stopped Alex Ovechkin to keep it a tie game. Seven minutes into the second period Fleury made a clutch save on Jakub Vrana. So, although this won't go down as his best game this post season, he gave his team a chance. Holtby was not the problem with Washington in the least, but he looked rusty. Again, these goalies will be better. The first half of the first period was a feeling out process. After a Collin Miller goal on the power play to kick things off, things went unhinged quickly. Brett Connolly scored a nice deflection goal that Fleury had no chance to stop. After Nicklas Backstrom made it 2-1 Vegas came back with less than two minutes left in the first with a William Karlsson beauty off the end boards. Not long into the second Reilly Smith added a goal off a tough rebound given up by Holtby. It was negated by a beauty by John Carlson. The set up by T.J. Oshie was the pass of the night by far. It is one of the more cliche sayings in sports "you need depth to win" but Vegas took this to heart. Three of the six goals were scored by the fourth line. After the power play goal by Miller and late tying goal by Karlsson and a quick go ahead goal by Smith... the fourth line took over. 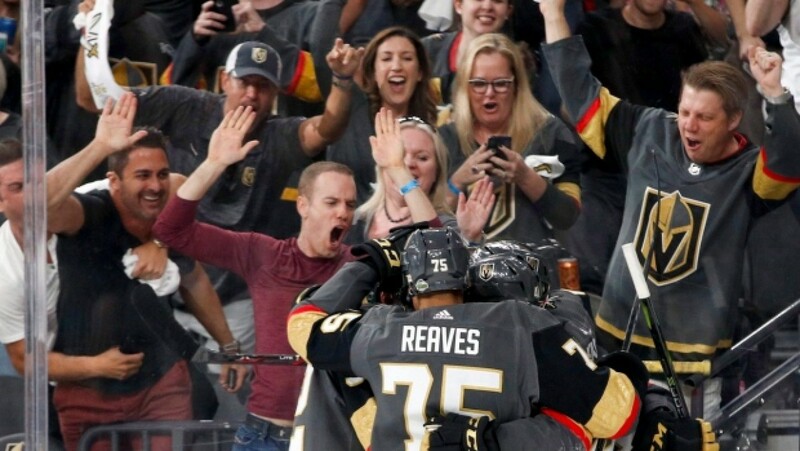 Ryan Reaves responded to Tom Wilson's early third period goal with a goal of his own and only his second of his tenure with Vegas. Not long after that Tomas Noesk got in on the action by finishing a beautiful cross ice pass by Shea Theodore. Watching the play carefully you can see Reaves lifting the stick of the Washington player with impeccable timing. If you are ever looking to define Vegas mentality I urge you to watch the final 15 second of this game. Pierre Edouard Bellemare forced the puck to the outside but Washington got the puck up to the point. As Ovechkin wound up, Noesk laid out his body and blocked the shot. When it went to the boards, David Perron took a hard hit to make a play and slip the puck to center ice where Noesk hunted it down for the empty netter. It was a simple play but watching Vegas work on that last play was remarkable. If you keep your eyes on the players who didn't have the puck the work ethic was remarkable. Brayden McNabb played his man perfectly up front. Nate Schmidt had his head on a swivel and looked exhausted near the end. He never was out of position though. Fleury was searching for the puck, on his feet ready. His footwork and movement in that last minute showed no signs of rust at all. When they scrolled to him after the empty netter he was trying to catch his breath. That last 15 seconds took everything Vegas had and they did it all together. The Vegas crowd was remarkable. The Washington watch party was packed. The show that these teams put on was fun to watch but whether that run and gun game is one either wants to play is hard to say. Some will say that Vegas found a way to win on home ice; something they have done all year and that Fleury made one more timely save than Holtby did but in reality I think Washington will look back on this as a missed opportunity. Fleury plays very few poor games. Although I wouldn't call this game poor, it was no where near his best. Vegas didn't win one game all year with Fleury in net and allowing more than three goals. Not one. Vegas relies on their goaltending more than most teams in the league and 99 percent of the time he is the story line. Vegas' ability to win one without Fleury being the headliner is dangerous for Washington because you know the cool, calm, collected brick wall that is Fleury will be back. This was Washington's chance, now they must fight for the split. Buckle up baby, this should be a wild ride. Do you think Vegas got lucky tonight? Will a lower scoring Game 2 be in the cards? Let us know in the comments below.